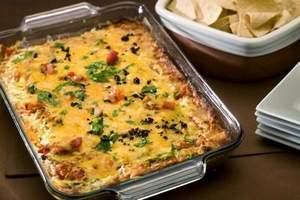 Offering a Mexican Recipe For Layered Bean Dip for your chips from an American-style restaurant recipe box may strike you as somewhat strange, but I have many customers who rave that this restaurant recipe is ”excelente”. The line cook says, "We are a traditional American-style restaurant. That simply means we have many culturally influenced menu items." This restaurant recipe is very easy and inexpensive ...but you, your family and guests will love the results. The restaurant customers certainly approve. It is a favorite restaurant appetizer recipe. Preparation time: 15-20 minutes. Serves approximately 4-6. 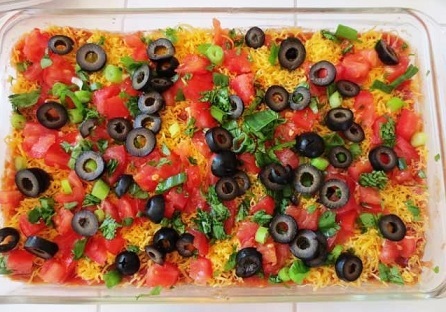 Enjoy your layered bean dip appetizer recipe and the company of those you share it with! "There's nothing like sitting naked in a beanbag chair eating layered bean dip. I hope they let me back in Walmart."